Established in 1924, DATTCO is a third generation family-owned business headquartered in New Britain, Connecticut. 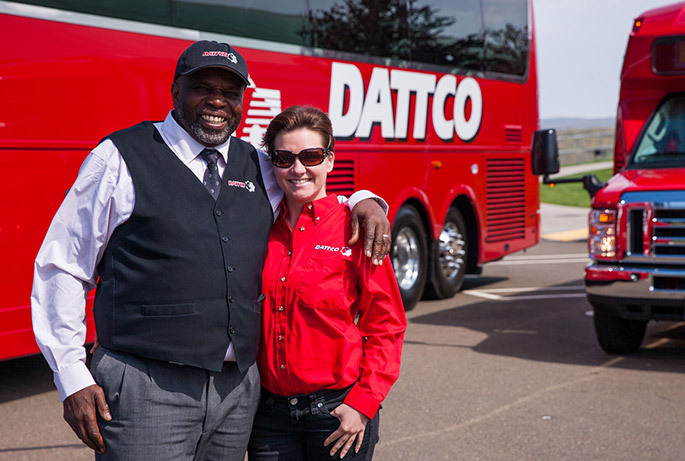 DATTCO has over 2,000 employees, multiple offices, terminals and service facilities throughout New England. We are a dynamic organization with a corporate culture driven by customer satisfaction and safety. Our strengths lie in the quality of our people and our products so that we can provide personal service and transportation solutions for you, whatever your need. DATTCO’s story begins on a dairy farm in Berlin, CT in the 1940s. Ed DeVivo took a side job to earn some extra money as a school bus driver for Pop Chicowski, who owned and operated one of three school buses for the town. In 1949, Pop retired and sold that 1939 Ford Superior body school bus to Ed. Shortly thereafter, cousin Mike Tolomea would join Ed to form D&T Transportation Company. In the 1960s, things began to pick up speed for D&T. The company purchased MASTCO, a local transit and charter bus operator dating back to 1924. Mike Tolomea retired and sold his share of the business to Ed and his brother, Lou who then officially changed the name of the company to its current acronym DATTCO! The company purchased three used motor coaches and provided service to the World’s Fair in New York City, and the small company began to make its mark in the industry! Over the next five decades, DATTCO continued to evolve and experience significant growth. DATTCO purchased new vehicles, was awarded school bus contracts and developed into several departments to create the full service transportation company we are today. So much has changed over the years, but our company values and inherent family culture remain to ensure the most important things continue to be our buses, our people, and most importantly, you. Every year DATTCO employees participate in several events that benefit the communities we serve. We’ve transformed a school bus into a library on wheels to provide underprivileged children with free access to books. We provide free transportation to sporting events for local school kids. We support and participate in a variety of charity road races and other charity events across the state.